THE 2019 winter season is now fully under way and Scotland’s highest snowsports destination is open for business! On Wednesday 30 January 2019, after a long-awaited start, Nevis Range Mountain Experience, near the Highland town of Fort William at the heart of the ‘Outdoor Capital of the UK’, opened its doors to ski and snowboard enthusiasts for its first official day of the 2019 season. Following one or two false starts, and after a couple of heavy snow falls and continuing cold temperature there was finally enough of the white stuff to get the show on the road. Nikki Stafford, marketing manager at Nevis Range Mountain Experience, said: “It’s awesome to finally open our doors for snowsports this season! When both locals and visitors get out onto the slopes of Aonach Mor, the mountain really comes alive. This weekend there was certainly a special buzz around the hill that only comes when the snow falls and the runs are full of skiers and snowboarders! We are definitely looking forward to further snowfalls this week to further improve on conditions. More snow is forecast to fall across the slopes of Aonach Mor this week and into the weekend. This will enhance current conditions and hide away those unwanted natural hazards. John Sutherland, activities director at Nevis Range Mountain Experience, said: “It is fantastic to be back on the hill enjoying the snow! A massive effort goes in from the whole team to get the mountain winter ready. When the snow falls it’s good to see everyone’s hard work pay off. Last Saturday was a great day on the hill, snow conditions were variable across the mountain (which definitely need a bit more for a powder day) with some good skiing on pisted runs and powder pockets could be found in some off piste areas. The sun was shining and we held the first round of the Nevis Range Freestyle Series!! Throughout winter 2018/19, a range of fun and family focused events will be staged at Nevis Range including the Nevis Freestyle Series and the Nevis Mini Shredder Series, quiz nights, ceilidhs, food and drink evenings; together with the welcome return of Ski-an-Duro, the ‘ever so slightly bonkers’ ski/board and mountain bike race from the summit to the gondola base station. Picture attached – snowboarder at Nevis Range. Please credit Steve McKenna. A selection of recent ski and snowboard images can be downloaded here: https://www.dropbox.com/sh/io8ss6y6313w77x/AACgp_n10mjLi9HM-FCm1-NKa?dl=0. Please credit Steve McKenna. The Nevis Range Mountain Experience lies seven miles north of Fort William, and south of Spean Bridge. It was opened in 1989 to develop a skiing/tourism facility on the mountain of Aonach Mor in the shadow of Ben Nevis. The development was undertaken due to a demand for skiing in Scotland that was inadequately served by existing facilities. Winter snowsports area with equipment hire and Snowsports School. Self-service Snowgoose restaurant and bar (gondola top station) and Pinemarten café bar (gondola base station) serving locally served produce prepared on site. The Nevis Range Mountain Gondola, unique in Britain, was originally constructed to transport skiers and snowboarders to the slopes. Today, the gondola whisks some 200,000 visitors each year to 650m where they can eat at the Snowgoose restaurant, enjoy a drink at the bar, walk out to the mountain viewpoints, or simply enjoy the stunning highland scenery. The gondola is also widely used by hillwalkers, climbers, paragliders and hang gliders on their journey to the clouds. There are 74 Gondolas in total and each one takes up to six adults. The ski area lies between the top of the gondola and the summit of Aonach Mor which, being the highest ski area in Scotland, has a good record for snow conditions running late into the season. It offers a variety of terrain from gentle beginner slopes by the top gondola station to advanced off piste runs on the Back Corries. Opening up the Back Corries with the Braveheart Chairlift expanded the skiable area considerably, providing intermediate and experienced skiers/boarders with an off-piste expanse, unrivalled anywhere else in Scotland! When it comes to ski and snowboard lessons, friendly and fully-qualified ski and snowboard instructors from The Nevis Range Snowsports School offer all standards of skiers and boarders the best learning experience possible. The school also offers specialist lessons when conditions permit in bumps, off piste and back country skills, as well as use of the freestyle terrain park. 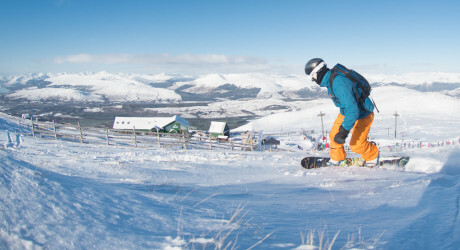 For information on ski and snowboard lessons go to https://www.nevisrange.co.uk/ski-board/ski-and-snowboard-lessons/. The Transceiver Park is for all mountain users to encourage better awareness and skills in the use of avalanche transceivers. It is recommended that all skiers, boarders and mountaineers accessing the Nevis Range Back Corries or any back-country terrain can use, and carry a transceiver, probe and shovel. Nevis Range has significantly diversified, creating a world-class downhill mountain bike track together with a series of world-renowned cross-country mountain bike trails in the Leanachan Forest. As a results the venue has hosted UK and international mountain bike events including several award-winning rounds of the UCI Mountain Bike World Cup since 2002 and a UCI Mountain Bike World Championships in 2007. Check out too twitter.com/allOutdoorsPR and twitter.com/allSportsPR.